I had a ton of fun talking to folks about my research on RPG Maker at the Games Learning and Society Conference last month. I am a big fan of the opportunity for conversation that poster sessions provide. I expected most people that visited my poster would be unfamiliar with RPG Maker and the community. That was true for about half of them. 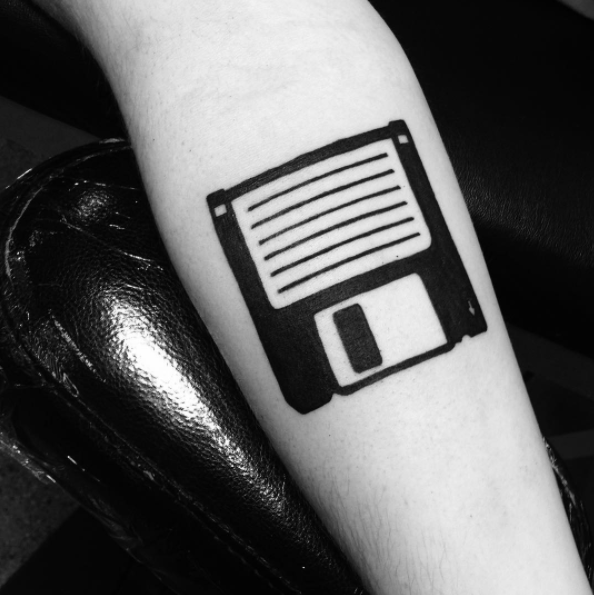 The other half consisted of people that had been using the software themselves and educators that had used the software for teaching computer programing or game design. I was thrilled to have the opportunity to ask one of these educators, Caleb Gentry, some questions about teaching with the software. Caleb teaches some very cool courses on digital media and programing at Sequim Middle School in Washington. His reflections on teaching with the software offer some interesting points of comparison and consideration for thinking about working with the software in a completely informal learning space. 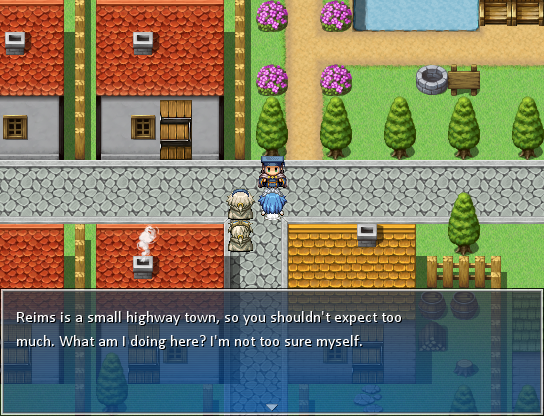 Where did you first find out about RPG Maker? What were your first impressions of the software and what made you think it could be a teaching tool? I was already teaching game design to middle school students and a few of them wanted to make RPG style games and the product we were using (Multimedia Fusion 2) to make our games wasn’t very efficient for this task. I began to look online for new software solutions and I came across the RPG Maker series. There are quite a few versions that I evaluated and some lacked essential features that I needed such as network folder support. How did you first use the software in a classroom? What were your learning objectives? What kind of curricula did you develop around it? After I tested RPG Maker VX myself I installed it for a single team of students in order to test how the students would react. They picked up on how the software worked quickly and easily and so I allowed them to continue to use it for their team game design unit. I now have a simple RPG unit in the game design class that is required. This summer I began testing Gamestar Mechanic and I think it fits well as a unit following the Gamestar Mechanic training. Moving middle school students of various levels of proficiency through the game design process can be challenging but I think there are great off the shelf products at this point that make it a legitimate choice as an elective class or as a unit in a core class. You can check out TexasGames.net for more reviews of software. How did/does it work in a classroom? What kind of reflections do you have on using RPG Maker to teach and how would you compare and contrast it to other tools? The product is a great fit for my needs. It is easy enough to use quickly yet complicated and flexible enough to keep the students engaged for months. In caparison to other tools we use I would say the basic programming is a bit easier, it really works for students who want to tell a story through their game. Girls usually excel with RPG Maker…probably because they tend to not care as much about shooter games. At the poster session I was able to tell you a bit about my research on the RPG Maker VX community. Using the application in a classroom is clearly very different from this community, but I am curious to know what kind of similarities and differences you saw between students learning to make games with the application in your classroom and the individuals from the web community we discussed? Just like an online community a learning community within a classroom has individuals that step up and lead the way. There are usually a handful of students who “get it” and assist others with figuring out the complexities of the software tools and process of game design and development. I think that it’s easier for most students to share face to face…mostly because posting to online communities requires more effort. The biggest difference is in the fact that in my classroom all the students are one age and in the online communities people of all ages can contribute. There are risks involved of course when people of many ages coexist in virtual space but I think it’s important for students to realize that they can become an expert in something at a young age and contribute to a larger community. If there was one piece of advice you would give to someone that wanted to use a game making application, like RPG Maker, to in their classroom what would it be? I think it would be to try and not worry about not being an expert of the software to begin with. Eventually you will need to be at least competent with it but at first you can figure it out together with the students. Obviously if an online community exists for help it’s a big plus so it should be a variable that you should consider when choosing game design software. I was extremely fortunate to have support early on in my teaching career from other teachers in the TexasGames.net community who made it possible to not only learn how to use the software but it figure out the best approach to teaching such a dynamic subject. I’ve tried as much as possible to give back to that community. I am thrilled to be back in Madison, if only for a few days, for the Games Learning and Society conference. Now in it’s 6th year, it is very cool to see how much the conference has grown and matured since I worked on the first two years of the conferences organizing committee. This year I am excited to be presenting a poster on some of my RPG research. Along with presenting my poster in person I wanted to put it up to share with everyone who isn’t at the conference. I have included the brief text from my poster here too. The RPG Maker VX Community site provides its more than 40,000 members a space to collaboratively critique and design PC role-playing games. This poster presents preliminary results from a qualitative study of this community. 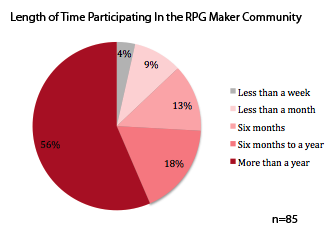 Analysis of interviews and discussions on the RPG Maker site, combined with information gathered through a survey suggest that the RPG Maker Community is scaffolding young game enthusiasts into a deeper understanding of game design and allied digital art perspectives. The study proposes a model for how members join, advance, and develop new literacy competencies through participation in the community. Online affinity communities are increasingly being explored as places where young people are acquiring new literacies (Gee, 2004). Through extensive ethnographic fieldwork Ito and others (2010) found young people “geeking out” in web based affinity communities where individuals are “learning to navigate esoteric domains of knowledge and practice and participating in communities that traffic in these forms of expertise” (p. 28). Studies of Flickr (Davies, 2006), fan fiction sites (Black, 2005), and Civilization fan-sites (Squire & giovanetto 2008; Owens 2010) support the idea that young people are acquiring critical new literacy skills in these communities. The communal and cooperative nature of these informal learning communities suggests that they be understood as communities of practice (Lave & Wenger 1991). Community members develop competence and refine their skills toward mastery through interaction and engagement, and encouragement from expert community members. The RPG Maker community offers a space to further examine these kinds of interest and affinity driven spaces. 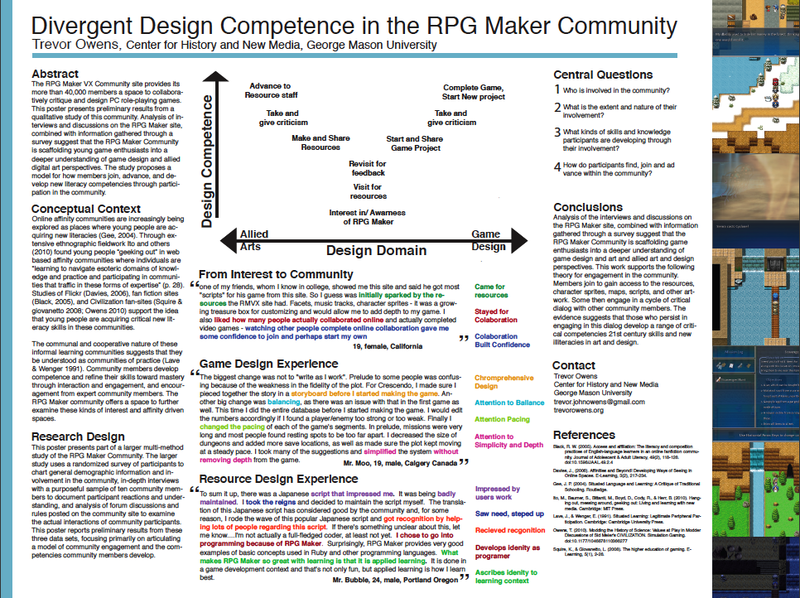 This poster presents part of a larger multi-method study of the RPG Maker Community. The larger study uses a randomized survey of participants to chart general demographic information and involvement in the community, in-depth interviews with a purposeful sample of ten community members to document participant reactions and understanding, and analysis of forum discussions and rules posted on the community site to examine the actual interactions of community participants. This poster reports preliminary results from these three data sets, focusing primarily on articulating a model of community engagement and the competencies community members develop. The poster format does not really provide an extensive space to analyze data, but I did want to give a sense of the kind of materials I have been working with to develop this model. In the future I will do some more in depth analysis of these kinds of materials. With that said, this does provide a flavor for the kinds of data I am drawing on. 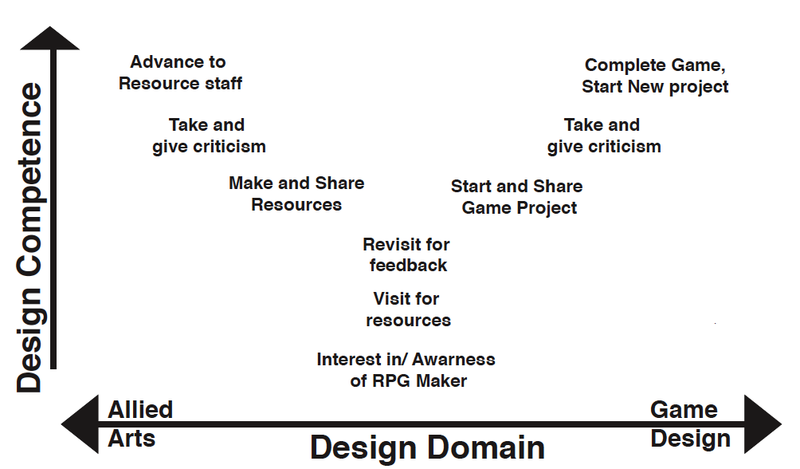 Analysis of the interviews and discussions on the RPG Maker site, combined with information gathered through a survey suggest that the RPG Maker Community is scaffolding game enthusiasts into a deeper understanding of game design and art and allied art and design perspectives. This work supports the following theory for engagement in the community. Members join to gain access to the resources, character sprites, maps, scripts, and other artwork. Some then engage in a cycle of critical dialog with other community members. The evidence suggests that those who persist in engaging in this dialog develop a range of critical competencies 21st century skills and new literacies in art and design. I am excited to announce that an article I wrote about how the game Civilization modders, players that edit and alter the game’s code, is now available as OnlineFirst through Sage. The project was a ton of fun and I hope it sparks some good conversations. You can find the abstract bellow. Sid Meier’s CIVILIZATION has been promoted as an educational tool, used as a platform for building educational simulations, and maligned as promoting Eurocentrism, bioimperialism, and racial superiority. This article explores the complex issues involved in interpreting a game through analysis of the ways modders (gamers who modify the game) have approached the history of science, technology, and knowledge embod- ied in the game. Through text analysis of modder discussion, this article explores the assumed values and tone of the community’s discourse. The study offers initial findings that CIVILIZATION modders value a variety of positive discursive practices for devel- oping historical models. Community members value a form of historical authenticity, they prize subtlety and nuance in models for science in the game, and they communicate through civil consensus building. Game theorists, players, and scholars, as well as those interested in modeling the history, sociology, and philosophy of science, will be inter- ested to see the ways in which CIVILIZATION III cultivates an audience of modders who spend their time reimagining how science and technology could work in the game. For those of you outside the great paywall, I have a copy of the article here on my personal website. The more I explore informal affinity communities, like the Civ modder community, or the RPG Maker Community, the more intriguing I find them. While the communities are themselves interesting, I think there are lessons in these spaces for rethinking more formal learning environments. This post is an attempt to refine some of this line of thinking. For the last few weeks I have been trying to put my finger on exactly what that something is. There are lots of individual things, for example the way participants in these communities learn to give and take criticism is important. But, I think there is something much bigger here too. Here is what I have for the moment. The most important thing that happens in these spaces is that participants experience what it feels like to commit to a project, invest in it, and over a long process, see it grow. At the heart of these communities, I think the real value is in their ability to let a participant chase their own interest and get a feeling for how pleasurable that interest chasing experience is. This is fundamentally about experiencing a kind of motivation. Csíkszentmihályi calls these experiences flow. It’s a terrible name, but a critical concept. Flow is a kind of single-minded immersion in a task. It is a pleasurable experience, and it is a fundamental part of developing competence and eventually expertise in a domain. The idea of flow can get rather squishy, but it does describe the generic experience of developing competence and mastery across a wide range of domains. What troubles me, is that I think many young people never get to experience flow in school, and if they do, only experience it in a single domain. I think places like the RPG Maker Community, and Civ Modders sites could serve as tools for schools to use to help give this experience to all students. I will borrow an argument from my high school gym teacher as an example of what I think schools need to do in this area. My gym teacher frequently explained to the class that the real value of gym class was for for every student to feel what it is like to exercise frequently enough to be healthy. Without that gym class, many of the students would never have felt what being healthy/ fit was. Without that frame of reference, many students who never exercise would not have any idea of how good it feels to be healthy. If students are not experiencing flow in schools there is a good chance that they will never have a frame of reference for how good it feels to develop competence in a domain they are passionate about. Schools do a reasonably good job at demonstrating some kinds of motivation to students. Every student experiences extrinsic motivation (do your homework or you fail the class), and many students internalize that carrot and stick, (If I do well on this assignment I will go out for ice cream). However, I don’t think many students get to feel what it is like to feel the kind of intrinsic motivation that comes from flow, and without ever knowing what that feels like, what it feels like to get lost in your work, what do those students have to compare their later experiences in work and life with? There are places in schools that provide these kinds of experiences, like music and art classes, and theater and athletic programs. However, when students experience flow in a single domain, they are likely to attribute the positive experience associated with flow to the domain. For example, a student that experiences flow as a violinist may well become convinced that playing violin is the only thing that makes them feel that way. In this case, they become convinced that there is one thing that they can do. Beyond the need to have this kind of flow experience, I think we need to think about helping young people find that experience in a range of fields. When thinking about the value of the Civ Modder’s space, or the RPG Maker Community, what I find most striking is that these spaces and communities provide a powerful means to engage in flow experiences. There are a wide range of other interest driven communities like these. Flickr has hundreds of active photo pools where budding photographers can engage in the same kinds of experience. Galaxy Zoo has a very active community of participants exploring and teaching each other about astronomy. Places like fanfiction.net provide the same kind of experiences for writing about a range of characters from popular media. Imagine if, for an hour or two a day, schools told students to chase their interests. Facilitators for this kind of experience could well send kids interested in making video games to explore the RPG Maker or Civ communities, Flickr for those interested in photography, fan fic for the kids excited about their pokemons. I think the best way to get students to experience flow is to let them chase their interests. 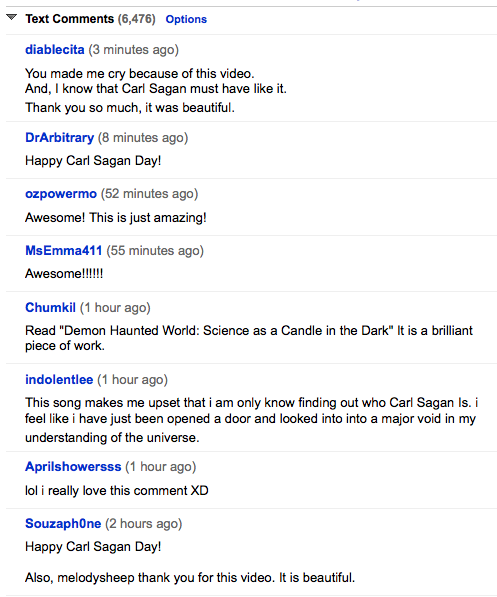 These kinds of web communities provide a great place to get to feel that. At this point, those interest driven experiences of competence are only available to the students that discover them on their own. If we think that equity is one of the most important values of our education system I think we need to seriously think about how we can get these kinds of experiences in the schools. I am excited to report that i have finished gathering data from my RPG Maker VX community survey and am well on the way toward finishing interviews with a subset of the respondents. For more information about this project see my previous post. At this point I thought I would share a cursory overview of some of the interesting preliminary survey findings. For those survey research junkies out there I should make clear that this survey is part of a qualitative research project. It was developed strictly as a means to gather descriptive data to provide a broader context for analyzing discussions on the site and interviews with community members. For details on the survey methods and response rates jump down to the last section of the post. Most of the community members are between the ages of 16 and 24, and of those most are between 18 and 22. As I will document through analysis of discussions and interviews the members of this community are developing sophisticated practices for taking and giving criticism as well as working collaboratively. In this space young people are both the teachers and the learners. While critics frequently lament students motivation and hard work it is clear that this communal space is providing a place for young people to cut their teeth as artists, designers, critics, and producers of digital media. 45% of the sample reports living in the United States. The rest of the group is spread across Europe, South America, and Asia. A majority of community members reported English as their native language (64%) the remaining 36% represent a smattering of other languages, including Spanish, French and Japanese. Most of those surveyed have been involved for more than a year and report spending a considerable amount of time each week on writing, design, and art projects for their games. Group members show significantly different amounts of time spent on different parts of projects. Some spend the bulk of their time writing others spend the bulk of their time creating game artwork. RPG Maker VX includes a scripting system, Ruby Game Scripting System, which extends the Ruby Computer Programing language. 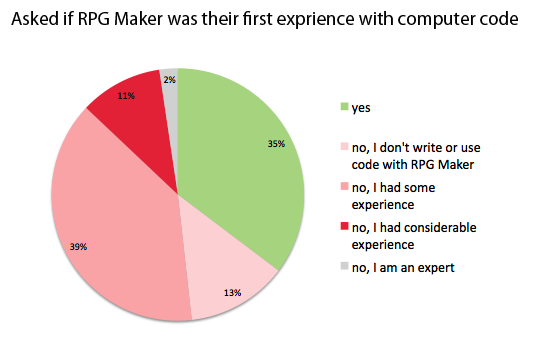 Nearly all (83%) of the community members report that they have used the games scripting system, and 35% of the respondents reported that working with RPG Maker was their first experience with computer code. When asked about their favorite video games participants cited a mixture of current and “classic” games. To get a quick sense of the kinds of games which appeared most frequently, scan the word frequency chart I generated with Wordle bellow. 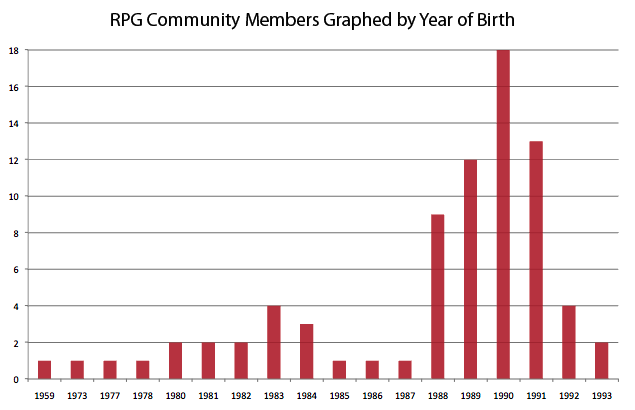 This is just the raw frequency of individual words, but it is easy to see the trends which emerge around some of the most famous super Nintendo role playing games and franchises. 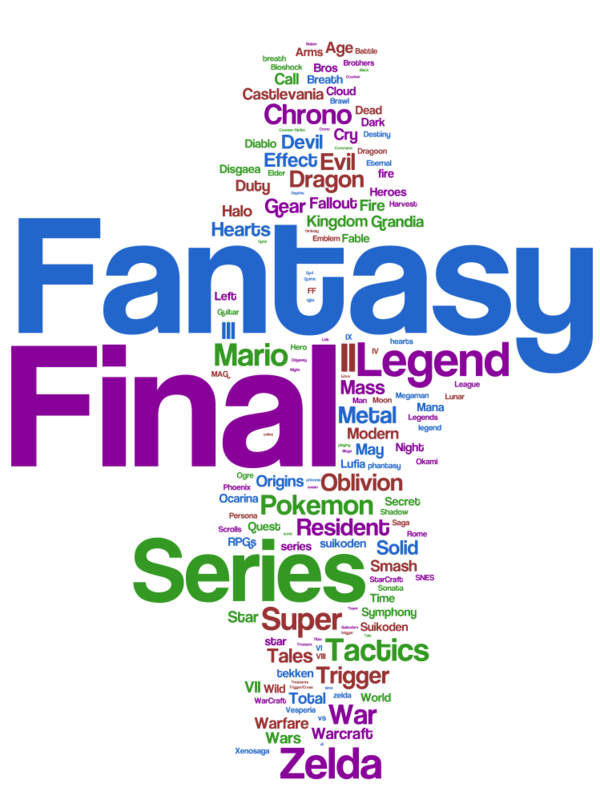 The Final Fantasy series, Chrono Trigger, Legend of Zelda, Secret of Mana, Breath of Fire, all appear prominently on respondents lists of favorite games. It is worth keeping in mind that many of these games were original released around or before the majority of these community members were born. As RPG Maker allows players to make these kinds of games, it makes sense that these kinds of games are also part of their list of favorites. While some might think of the kinds of graphics and formats for games which RPG Maker creates are a weakness of the software, there is good reason to believe that these gamers love for SNES RPGs connects them to a kind of game and experience which they find deeply engaging. It is best to develop a survey with a specific population in mind. 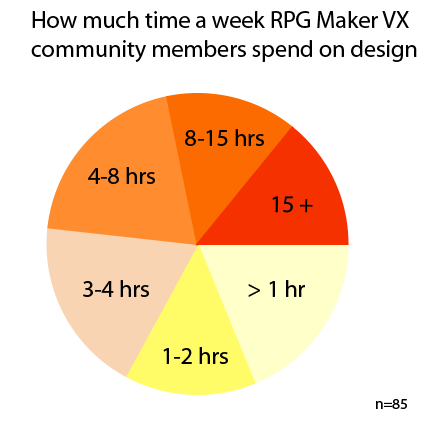 Part of the difficulty of surveying a diffuse community like the online community associated with the RPG Maker VX site is in defining the boundaries of that community. The site has over 40k members, and during any given visit to the site nearly twice as many non-members are viewing the discussion boards as members. It would be impossible to accurately sample non-members who visit the site, there is no trace of their visits. With that said, instead of setting upfront criteria for who counted as a community member (based on post count, or number of visits, or the length of time they have been involved in the community) I decided to create a sample of individuals who had logged in within the last week. While this will inherently sample more frequently involved users it would also include a sizable segment of other more infrequent visitors. To sample a cross-section of community members in a given week I used the sites member search system to sift through the total number of folks who had logged in over the proceeding week, in this case it was 1740 members. From there I sampled a randomly selected group of 160 members. I have received 85 responses, giving me a respectable 53% response rate. In accordance with George Mason’s human subjects review boards requirements I did not contact anyone who either did not list their age or listed their age as less than 18. In the process of creating the sample I rejected individuals that fell into these categories. Most individuals did list their age and only 10 of the randomly selected members listed themselves a under age 18. While the response rage is acceptable, I will note two reasons for why members may not have responded. The community message system has used as a mass emailing system for bots. In many cases potential respondents required me to offer a range if kinds of evidence to demonstrate that I was in fact a human before they would click the link to take the survey. Aside from fear of bots, in two cases I heard from individuals who were uncomfortable taking a survey in English because it was not their native language. This suggests that the survey may not fully capture the international character of the community. A while back, I wrote a post about a very neat piece of software called RPG Maker. I never really got to building a game with it, but I have become fascinated with the community that has come together around the software. This post begins a series of entries about a research project I have started to explore how this community is scaffolding game players into game makers. In this post I will briefly outline some of the interesting. The image below shows an screen shot from Prelude to Identity, a well received game in the community. Everyday several hundred members of the RPG Maker VX Community read through a new set of project development posts on the community’s forums. 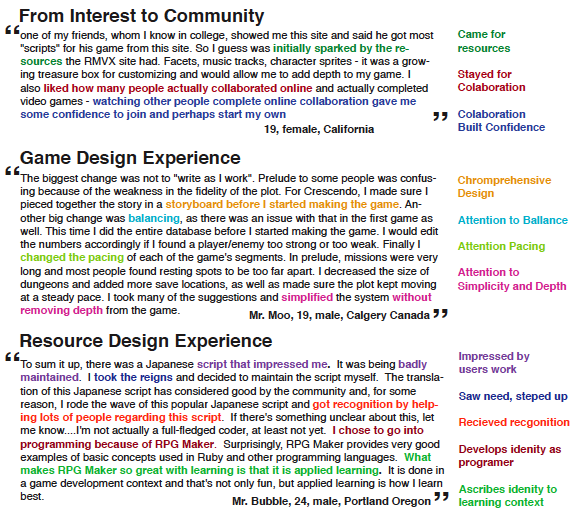 In each of these posts amateur game designers, primarily between the ages of 18 and 24, share 500-1000 word game proposals for community critique. These posts include elements of traditional composition, like the proposed games setting, characters, and storyline. They also include elements unique to games as new media, like the proposed game’s mechanics, artwork, and audio. Over the next few days, each of these proposed projects receives extensive feedback from the community. After substantial revision, refinement, development, and continued engagement with the community, some of the community members’ complete their games and share them with the group. For an example of some of the thoughtful kinds of design and composition that goes into creating game maps see Mr. Moo‘s video of a follow up game Crescendo of Identity. I have received permission from my schools human subjects review board to explore the community through a diverse set of methods. I have started conducting a survey to get a sense of community members activity, behaviors, and participation. In a few weeks I will start and a set of interviews with community members to get a deeper sense of how members understand their participation and explore some of the various roles they are taking on. My goal is to then use the survey and interviews to help add texture and context to a detailed analysis of community interactions as preserved on the message boards. I have already started to get back survey results. I am excited to share some of the preliminary information here in the next few weeks. Spore is not a good game for learning about evolution. As many have eloquently articulated the games mechanics clearly place the player in the role of intelligent designer. With that said, I think this case provides an interesting moment to explore the relationship between the role the game puts players in and what players do with that role. While I would agree that the game does not teach people about evolution, I haven’t seen anything about how players are actually understanding and interpreting the game. This is indicative of a trend across game criticism and scholarship. Instead of exploring how games are understood by their players, they are most frequently analyzed with the assumption that any perceived in adequacies in the mechanics of a game will transfer uninterrupted into the minds of the games players. To underscore the problems that arise in this kind of thinking I present an extreme case. Below is Youtube user, KyoraMishiso’s interpretation and presentation of the game. Kyora is a young aspiring cartoonist who reports her favorite artist as Enriquo Rermi. Two years ago she posted this video, titled. “Spore Evolution” Below is her video. In this example Kyora has used the game as a platform for telling a story. She is using the game, not the other way around. She took the mechanics of the game and filled in the gaps in the games treatment of evolution with her own knowledge. She then created this video, which has now been watched more than 60,000 times, to articulate her interpretation of the game. While I see no reason to accept her understanding of the game as anything more than a personal one, quite frankly, an understanding of how one individual engages with the game is more than most analysis of the game which I have seen. I offer this example to illustrate one way in which a player has engaged with the game. With that said, this sort of example should provide a wake-up call to individuals that think understanding games does not require understanding how players understand, interact with, and make use of their game play experiences. While analysis of the game as artifact can provide valuable information about it’s creator’s intentions those intentions are just one layer of a games meaning. Each player brings their own experience into dialog with the artifact to make their own meaning, and I think this example helps illuminate the need to understand the meaning players make as they co-construct their experiences in games. I think cases like this point out how frequently those interested in studying games start out by asking the wrong questions. Instead of asking, what does a game mean; we should be asking what does a game mean in a given context? We should be looking at how are players using the game and what kind of agency they are expressing through interaction with the game. What argument is the games creator making and how are it’s players understanding, misunderstanding, agreeing with, rejecting, or otherwise complicating that meaning? When I first stumbled across Carl Sagan – ‘A Glorious Dawn’ ft Stephen Hawking (Cosmos Remixed) I thought I would find a quick laugh, instead I found something profoundly moving. This autotuned mash-up of documentary footage ends up leaving viewers feeling much of the awe which so much of formal science education fails to communicate. The video and song capitalize on the sing-song voice, poetic statements, and dramatic style Carl Sagan, and many other astronomers are known for, and use them to develop engaging and moving video and music. I was delighted to see that the feelings this piece evoked in my wife and I was not just our own funky science geek tastes. Since September 17th the video has been viewed 1,550,136, and those viewers have left their thoughts and feelings about the work in the comments. While youtube comments are notoriously the lowest form of communication, these comments reflect and reiterate my own feelings about the piece. The National Science Foundation is always looking for ways to get the public excited about science. I say they should give that money to melodysheep. Think about it, how many of the 1.5 million people that viewed this video would have viewed the two documentaries which the video drew from? This week I had the honor of participating in the Library of Congress’ national strategy for digital news summit. The Library gathered together a diverse mix of corporate and public archivists, representatives from public and private foundations, and librarians to discuss the digital future of news. The conversations focused on both how to preserve born digital news and how to archive old news migrating into digital forms. I was honored to have a chance to bring in my perspective as a consumer of that archived news. I gave a short presentation about some of the ways digitized historical news enables historians to ask different kinds of questions. 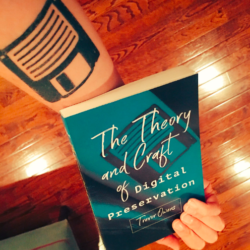 I think the talk has some implications for both historians and digital archivists, so I thought I would share the gist of the talk here to continue the conversation we started at the meeting. In my mind this contributes to ongoing discussions about the role that digital tools should play in re-framing conversations about historical methodology. Since the structure of the archive plays a significant role in the structure and character of the kinds of questions a historian can ask it’s crucial for historians to be involved in helping shape these archives. On May 11, 1921, the world’s most famous female scientist disembarked from a long Atlantic voyage in New York City. For the ten weeks Marie Curie toured the United States, she was greeted as an international celebrity, according to the New York Times, the “biggest hit of any celebrity who has come to New York” for quite some time. Curie was greeted with speeches and fanfare in New York, Washington DC, Pittsburgh and Chicago, gracing major news papers several times a week. Less than a year after American women won the right to vote through the 19th Amendment, Marie Curie —the only noble laureate twice over and worlds most distinguished women of science— visited the United States. Last year I decided to explore how different periodicals reported on Curie’s visit. Analysis of coverage of her visit exposes divergent ideas about the place of women in American science, society and work emerging in the early twentieth century. For our purpouses, this case also exposes some of the transformational power databases and digital tools present for historical inquiry. It took me six seconds to find the 1512 references to Marie Curie in the entire history of the New York Times, the Atlanta Constitution, the LA Times, the Boston Globe, the Washington Post, the Chicago Tribune and the Wall Street Journal. Now this obviously saved me a ton of time, but the implications of this search are much deeper than this. Reading the entire history of these publications for mentions of Curie would not only be impractical, it would be impossible. If I had wanted to explore press coverage of Curie in the pre-full-text search world, I would have selected a few key dates when I would expect her to have been mentioned, gone to the library, and rolled out the microfilm. I would have found many of these articles, but the time it takes to find them requires a larger upfront commitment to exactly what I intend to explore, and how I want to explore it. With search I have the ability to quickly get a feel for different questions in different queries while simultaneously uncovering mentions of Curie on editorial pages and in periods I would not have expected to find her mentioned. Repositories like Proquest historical News are powerful, and their ability to allow users to explore connections between items inside their collections has a powerful effect on the kinds of questions historians can ask about their contents, but that is just the surface of the potential these databases afford. 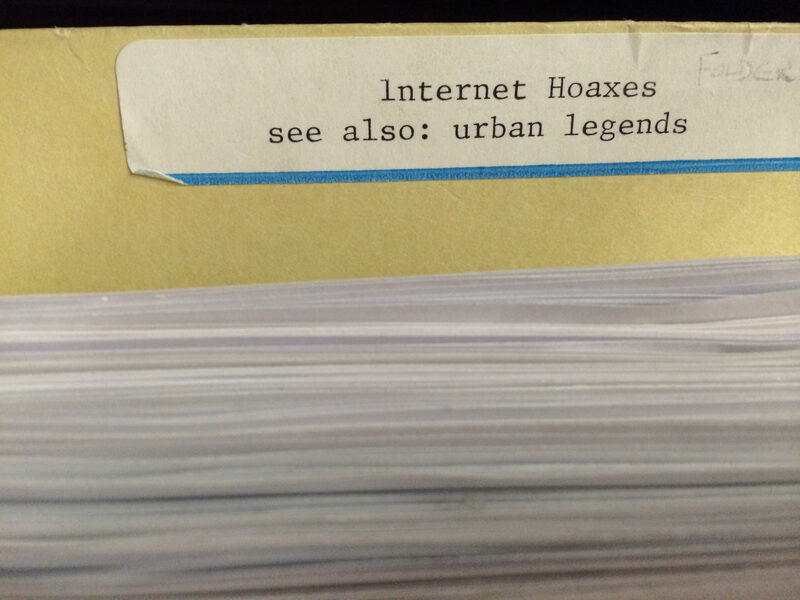 With a tool like Zotero it is possible to aggregate materials from a variety of different sources and mine them in sophisticated ways for historical insights. 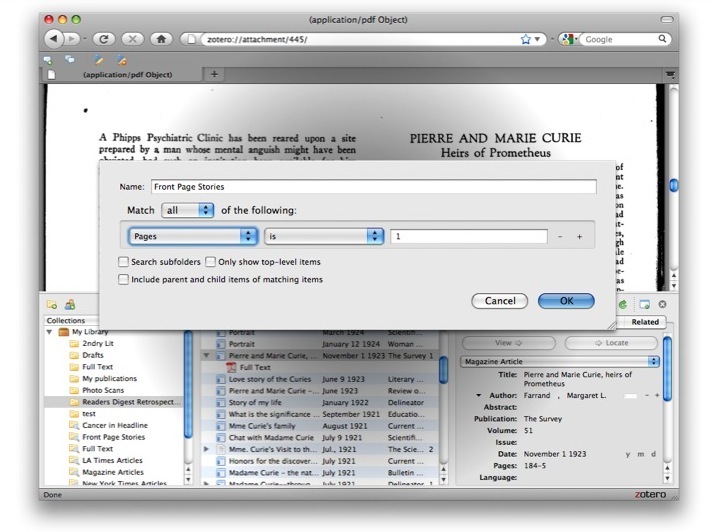 After I gathered the relevant items and fulltext PDFs from Proquest I pulled a similar search through Reader’s Guide Retrospective. While readers guide retrospective did not offer seamless integration with Zotero I was able to pull out structured data for hundreds of references, and with a few clicks had submitted inter-library loan requests for fulltext scans of the most relevant articles. 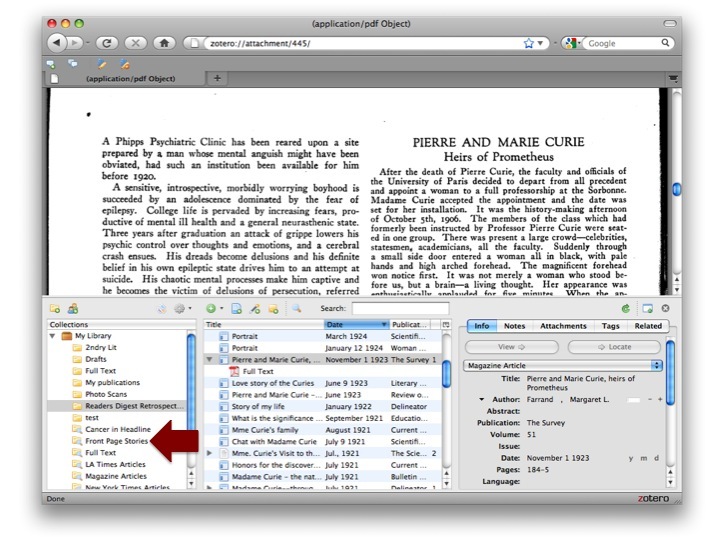 When I received those PDFs I was able to simply drag and drop them into Zotero to store alongside the data. As I constructed my personal archive I was then able to turn Zotero’s search capabilities on the collection to explore interesting relationships between my data. I created a variety of saved searches from criteria in my research data. 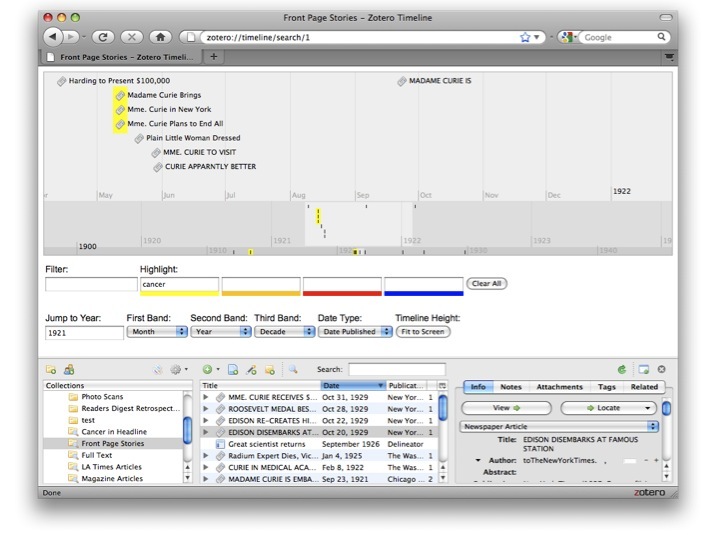 Page numbers are included in this data for a specific reason, they are crucial for citation. Beyond that purpose, page numbers also represent an important statement about the objects in my collection. While all of the articles I discovered about Curie are relevant to my analysis articles on the frontpage of a newspaper are particularly relevant to questions about how Curie was presented to the public. This field in my database, the page on which each article can be found, was included to help people find the articles in citations, but it, like many other fields in my database, also communicates an historical significance. Once I had isolated the frontpage stories about Curie I had the opportunity to further explore this subset of thirty or so articles. Zotero’s ability to visualize the collection in a timeline allowed me to quickly visualize the chronology of Curie’s appearances on the front page. From there I could use the “highlight” function to further explore the data. Based on my experience with discussions of Curie’s visit to America I decided to highlight the mention of cancer in titles, finding the word in a plurality of the frontpage studies leads to a particular historical insight. Marie Curie’s contributions to science are impressive, but the connection between her work and a cure or treatment for cancer is tenuous. While the word cancer does not appear, in any significant fashion, across all the hundreds of article titles about her visit, it does show up in a significantly larger portion of the front page story titles. This provides tentative support for the notion that Curie’s work, and importance, was misrepresented in feminine terms, framing in the feminine role of healer instead of the masculine role of a scientist. Implications for historical methods: While it is indeed possible to count these things out without these sort of tools, the ease at which I was able to mine a large set of documents for relevant information, and historical insight, has important ramifications. As far as I am concerned, the only way that historians can overcome the issues that arise from the problem of abundance of historical materials is to begin using tools for data analysis that allow for “distant readings” of texts. This can only be accomplished if some larger issues are observed in the creation and digitization of historical records and texts. Implications for historical archives and databases: Exposing fulltext and coherent metadata is essential, building fancy repository specific visualizations and manipulations is extravagant. What is going to matter to historians of the future is the ability to take your data, dump it onto a tool like Zotero, and use any number of analytical tools to explore that data in relation to information from other repositories. In that light, any fancy encoding and detailed levels of information you work into your resources is of limited use if that is not carried across into other spaces. We are not going to solve the problem of abundance by digging deeply into small sets of documents encoded in TEI, were going to get there with the metadata we have, dirty OCR and the emerging universe of entity extraction. Apparently war game sims sell, even oldish ones. 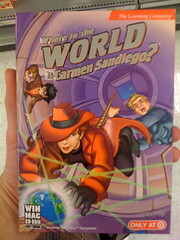 Last weekend I took a quick walk through the games section of our local Target to see what new Wii and DS games looked fun. After picking up a copy of Cooking Mama, I took a gander at some of the games on the next row of shelves. 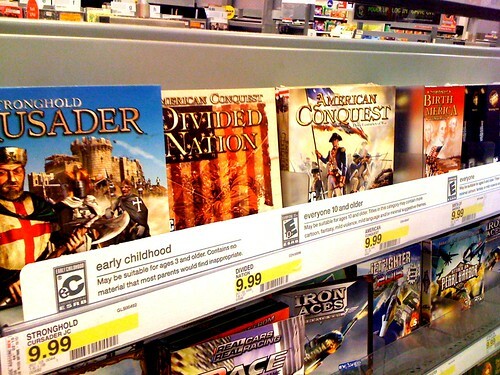 The next aisle over offered an extensive selection of games, each priced to move at $9.99. It is kinda like the minor league for commercial video games. There are major league veterans, like Civilization III, riding out their final years. Other games, like the rack of historical battle games pictured above, just never had what it took to make it to the majors. Alongside these games, I also found a slate of old edutainment favorites, Math blaster, Oregon Trail, Carmen Sandiego, all the games I use to play on 3.5 floppies. What are these games doing here? 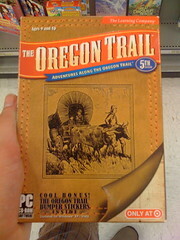 The original Math Blaster was released in 1987, Carmen Sandiego in 1985, and Oregon Trail in 1971. 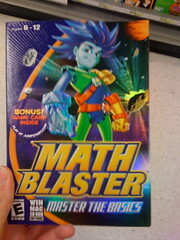 While these editions are clearly updated, for example Math Blaster is now in 3D, from what I can gather they are really just better looking ports of the original games. Are these the educational equivalent of Mario and Donkey Kong? Are the core ideas behind these games so strong that we just haven’t topped them, or do publishers just go with what’s safe? Furthermore, what is the market for these games? I would assume the audience for these titles is still the same, targeting parents who want to buy educational games for their kids, it’s just that now they’re marketing to parents that grew up with these same games.